Integration with VirtueMart for Joomla! If you are using an ecommerce store built with Magento, and you want to record your orders in SalesAutopilot, then Magento's SalesAutopilot extension will allow you to do that. This extension can be downloaded from the Magento Connect marketplace. Install the extension. To access the Settings, click on the Admin Panel, select System and then go to Configuration. Then, select SalesAutopilot on the left. Get Order Lists: once you have provided the API username and the API password, click on this button to allow Magento to get a list of your order lists from SalesAutopilot. Order List: after clicking the Get Order Lists button, your SalesAutopilot order lists will be listed here. Select the list where you want to record your orders transferred from your Magento store. Order Form List: select a form that belongs to the order list you selected. The order details will be added to the list with this form. The only parameter of the form that matters is that it has to be a "Multiple product order form, multiple orders from every product" type of form. Every other parameter of the form will be defined by the data transferred from Magento. Any form-related actions will be carried out as usual. Data Update Form List: select the profile update form that belongs to the order list. 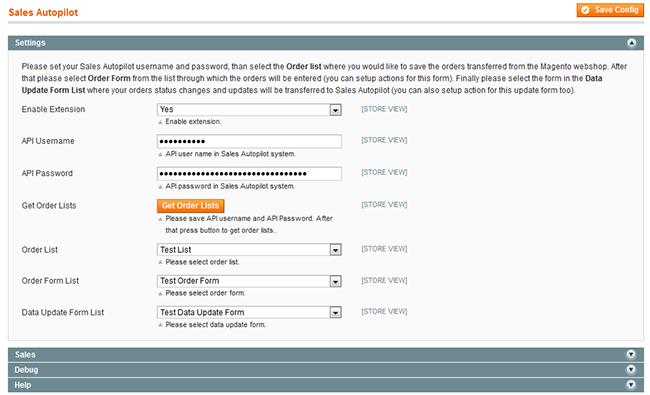 If an order status changes in Magento, then the changes will be transferred SalesAutopilot with this form. Any form-related actions will be carried out as usual. When you are done with these settings, click on the Save Config button at the top of the page. From then on, every order that comes into your Magento store will be automatically transferred to your SalesAutopilot order list, where you can set up personalized follow-up sequences, segmentation based on products ordered, etc.